I was catching up with some of my favourite blogs when I saw that Polish Pixie has a post about OPI's new collection for fall 2009/winter 2010. If you like nail polish posts, make sure to check out Pixie's blog as she has gorgeous nails and awesome swatches. - Suzi Says Feng Shui. I'm super psyched about this! It seems like OPI is finally doing a less boring collection of many different colours. I'm especially excited about Jade is The New Black and Lucky Lucky Lavender. What are your thoughts on this snippet of new information? 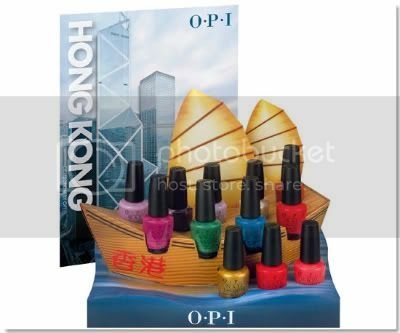 9 Responses to "OPI Hong Kong Collection"
Shayla - I just get mine from Trade Secret. It's not cheap (9.99) but I just deal with it. Can you tell I did some investigating last night? you can see the swatches for the colors of the new Hong Kong collection in the block of lackoholic. The colors are amazing.